A couple of weeks ago the Universe carried a feature article on the Catholic martyrs of Oxford, which carried this photograph, taken by me, of Archbishop Longley blessing the plaque in honour of Bl George Napier (executed 1610), without acknowledgement. 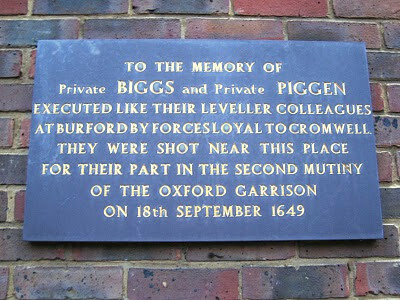 It also showed the plaque in honour of Bl Thomas Belson, Bl Humphrey Prichard, Bl George Nichols and Bl Richard Yaxley (all executed in 1589), which I had erected: I got permission from the building's owners, I got planning permission from the council, I commissioned the plaque, I raised the money to pay for it - yes you might say I had something to do with it. And did I mention that I got Bishop Kenney to bless it at the LMS Oxford Pilgrimage in 2008? Well, the Universe thought it best not to mention any of those things in a two-page feature article on the subject. I got these plaques done for the glory of God in his martyrs, not for the glory of Joseph Shaw, but I felt it necessary to protest at this airbrushing out of my role because it wasn't really me they were airbrushing, but the role of the Traditionalist community and the Latin Mass Society. Without the processions through the streets by many faithful Catholics attending the LMS Pilgrimages in rain and shine every year I wouldn't have been able to make the case for these plaques. And the truth is that while the Latin Mass Society, its supporters, and successive Archbishops of Birmingham (Bishop Kenney represented Archbishop Nichols in 2008; Archbishop Longley came himself in 2010) have been promoting the cult of these great Catholic martyrs, some more politically correct elements of the Catholic establishment have been pushing in a quite different direction: the direction represented by the 'ecumenical memorial' in St Mary the Virgin, featured enthusiastically in the same Universe article. 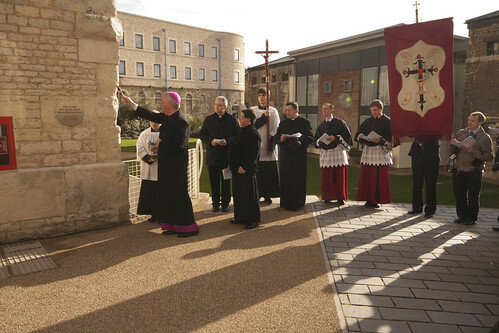 Sir, Readers of your Feature article on the Catholic Martyrs of Oxford (16th Jan) will be interested to know that the photograph of Archbishop Longley blessing a pl aque in honour of Bl George Napier (which was taken by me) shows the Latin Mass Society Pilgrimage to Oxford mentioned in the article. The plaque honouring the four Catholic martyrs of 1589 was installed in the context of the same pilgrimage two years earlier, in 2008. The Latin Mass Society has been extremely active in promoting the cultus of these important men. The plaque in the (Anglican) University Church, St Mary's, lists not 17 Catholics executed by Protestant rulers (as reported) but 16, alongside five Protestants executed under Mary Tudor and two Protestants executed by other Protestants: Archbishop Laud, a High Anglican executed by Parliamentarians during the Civil War, and Stephen College, a collaborator with Titus Oates, executed under Charles II. Justice caught up with College little more than a month after the execution of St Oliver Plunkett, which College helped to engineer. Why it was thought appropriate to commemorate him is a mystery. It is quite baffling that the odious Stephen College is listed as a 'martyr': he was in fact a political agitator, admittedly one motivated by religious bigotry. 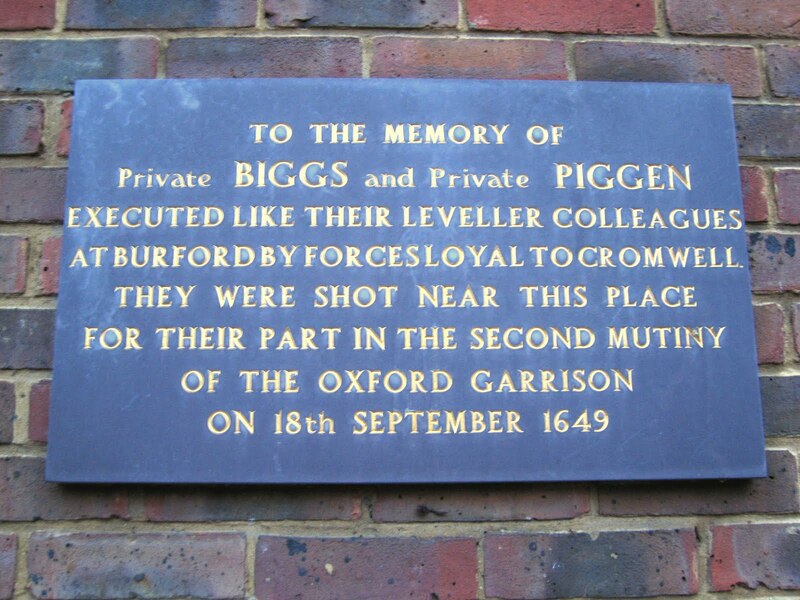 I'd much rather see listed the two Leveller soldiers executed in Oxford by their fellow Parliamentarians for their role in a mutiny against Cromwell in what is now Gloucester Green. They have a plaque of their own of course. Another of the many bizarre things about the ecumenical plaque is that it lists as martyrs three men involved in the riots against the imposition of the Prayer Book in 1549. The Universe includes them in its count of Catholics; John Hunwicke once cheekily suggested they were High Anglican martyrs (well, they were members of the Anglican Church presumably and were against its protestantisation, weren't they? ), but the point is that those involved in violence don't come into the category of 'martyrs', however admirable they might be. Otherwise we'd have to include everyone whose death in the Civil War was connected in some way with religious idealism. A martyr, in the essential signification of the term, means a man who dies, not merely to bear testimony, but to bear testimony to the truth. Edmund Campion died because he believed in the Pope and the Mass. Thomas Cranmer died because he disbelieved in the Pope and the Mass. It is an intelligible attitude to say that Crammer was a martyr and Campion was not. It is an intelligible attitude to say that neither Cranmer was a martyr nor Campion. But to say that both Crammer and Campion were martyrs is to say good-bye to all reason and all common-sense. Each of them died in the belief that he was bearing witness to the truth; and if you accept both testimonies indiscriminately, then you are making nonsense of them both. The only point in common between the two men is that both died for their religious opinions. It is ridiculous to suppose that either of them accepted death as a protest against the theory of religious persecution. On the contrary, Cranmer persecuted with the best of them. Neither of them minded being put to death for the sake of religion; but either protested that the religion which he died for was the true one. It is a poor compliment to such heroism to conclude that after all it does not much matter one way or the other!